Analyzes the source of the mitzvah of Tefillah and discusses whether it is Min Hatorah or M'drabanan.. Focuses on the basic framework of Tefilla - starting with praise, continuing with requests, and fini.. Focuses on the sugya of Kavana in Tefilla. Also explores the various forms of Kavana and how t.. 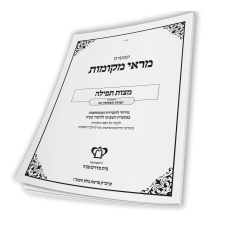 Details of Tefilas TashluminDiscusses the Halachic principle of “Tashlumin”, allowing one to ma.. This choveres continues our discussion on the Halachic principle of “Tashlumei Tefilla”. Specif..